10 Best Packable Daypacks 2019 – What Should You Choose? What to Look for When Buying a Packable Daypack? Think of how organized you will want to be whether you’re going for a hike, sports event or travel. The lightweight packable daypacks are ideal for carrying your essentials and enable you to explore more freely. Let’s check! In this article, I will highlight a list of the best packable daypacks suitable for a range of travel settings and budget. Whether it is large enough to fit everything you need. How organized do you need to be? If you need to be tidier, then choosing one with plenty of pockets will be more suitable for you. The degree of durability. Consider a lightweight of packable daypacks that can withstand a certain degree of durability in different environments. If planning to use a backpack for long hours, you should consider packs with features that increase comfort and help in distributing the weight, e.g., padded and wide shoulder straps or a sternum strap with a waist belt. Waterproof resistant: If traveling in a water-based environment, choose a pack fabric that is water-resistant or those with tear and abrasion resistant. 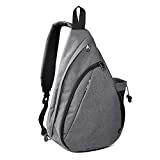 This is a versatile lightweight packable backpack suitable for day trips, outdoor camping activities, vacations, hiking, cycling, school bookbag, or shopping. Hikpro provides you with the ideal solution for packing large capacity luggage for outdoor activities. Lightweight material that weighs 8 ounces (8 oz) and a roomy main compartment that fits stuff up-to a capacity of 25L and has a size of 19*12*8 inch. Fold down compactly. You can fold into a small sandwich size and put it into your suitcase, car or in a bag without occupying much space. When opened, it expands large enough to fit all your essentials. Durable and long lasting features. It is made of high-quality water and tears resistant nylon material, with an abrasion resistant SBS zipper. The pack has Bartack processes in more than 12 places. It has been on the market for 20+ years and can last many years with a warranty of 5 years adding value for money. The main pocket is large enough for all your luggage. Outer big pocket which is ideal for your IPad or magazine. Outer small pocket provides quick access to frequently used tools like the camera and guidebook. Two mesh side pockets help you add a bottle of water or carry an umbrella at the side pockets. The inner zippered pocket is used as the storage pouch for valuables like cash, credit cards, and your passport. It has comfortable wide breathable mesh shoulder straps which can enable you to carry the backpack for long. You can easily adjust the length of the straps and lock them firmly on your shoulders. It has a 5-year warranty with reinforced points to ensure it lasts many years. It has comfortable, easy to carry and adjustable shoulder straps. The straps can also give good air flow. Non-corrosive SBS two-way zipper for smooth operation. 100% money back guarantee. If you’re not happy with the HIKPRO product after 30 days, you can get 100% refund of the purchase price. Perfect gift for everyone; it can be used by both adults and kids. Keeps your stuff well organized and in order. I can recommend this lightweight and durable packable daypack for all your daily activities and short trips. The different compartments help keep your things well-organized and protected from water drops. This is a packable hiking daypack with more than enough room to store all your essentials in a lightweight bag. The bag comes with a watertight pack where you put all sensitive gadgets and documents when near or in water. It is available in black, blue, deep blue, purple, dark green and red color. These packable daypacks can be used for almost every occasion, and it is small enough to toss at the corner of your suitcase. Weight, size, and capacity: The daypack has a large size capacity of 30L with Lightweight of 320g to provide you with enough space to carry out your luggage. It is made of high-quality nylon material for its ultra-lightweight. Several compartments: It has a front compartment big enough to store books, an iPad or magazines and inner zip pockets for storing small items like money pouch and credit cards. A nylon mesh material at the two sides of the backpack can store water bottles. Ergonomic features: It has breathable mesh shoulder straps with adjustable buckles to increase comfort especially when carrying the backpack for long hours with a front chest strap/buckle. Durable: It is made up of water-resistant nylon fabric to minimize its weight and strengthen the daypack long-lasting performance. It also has a durable two-way resistant SBS metal zipper across the backpack. Compact size: It has zippered inner pockets that can fit anywhere with a size of 17*17 cm and unfolded size of 48*30*20 cm (H*W*D). You can fold it to fit in one of the inner pockets. Keep things well-organized with large storage space. It has bar tacking reinforced points to increase the bag’s longevity. Return policy if not satisfied with the backpack. 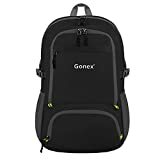 Gonex 30L lightweight packable daypack has several compartments for organizing your things with a large front pocket for keeping more utilities for college students. This backpack is recommended for carrying light items for your daily tasks. G4Free was designed to provide a perfect balance between size, weight, durability and storage capacity. This adult size backpack can be folded into a smaller handheld carry bag when not in use. Comfort: The straps are padded to add extra comfort and a chest clip to tighten the backpack against your body. The chest clips can also double as a whistle to blow when you’re in danger. Organization: The double-sided pouch at the top can be used to store and quickly access smaller items. Using the exterior top, you can store items like digital cameras, cellphones, etc. whereas the interior can be used to store more important items. An open spandex pouch at the exterior front allows access to bigger items and a sports bottle pocket at each side of the backpack. The side pockets have straps to secure your water bottle. The main compartment had a fabric divider with a top double-sided pouch to provide additional storage space for your items. The top pouch has an adjustable strap to tighten or loosen the slack. The packable daypack is double lined at the bottom to add the durability of the pack. Drawstring lock: You can use a drawstring to fit more items into your G4Free top pouch. You will not be limited to a zipper-lock because drawstring gives you more or less slack when needed. High capacity: can store items of up to 40L making it larger than another packable backpack. You don’t have to carry more than one bag when going on a trip. G4Free is large enough to carry what you need. Versatile: G4Free is ultra-light and ultra-durable packable daypack. It is suitable for hiking, occasional travel, alternative suitcase, camping accessories or to pack your beach accessories. Durability: the G4Free backpack is made of strong wear and tear resistant nylon material to provide long-lasting performance and strengthen the bag. Size, capacity, and weight: when unfolded it has a size of 22.8*13.4*7.8 inches, and when folded it has a size of 9.4*7.8*3.9 inches. 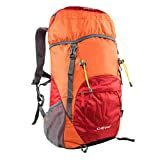 It has a capacity of 40L and ultra-lightweight of 12.7 ounces. Enough storage space to carry everything you need for your trip. Has a capacity of 40L. Can fit into an ultra-combat pouch. Due to its lightweight, you can easily fold into a small pocket and pack it into your purse without taking up a lot of space. Long lasting due to the high-quality nylon fabric used to make the backpack. Very light with supported chest clip and padded straps to enhance comfort and allow you to carry the backpack for long hours or run with it. A high-quality super lightweight, packable daypack designed to solve your travel problems. It has a stylish look with waterproof resistant and high-quality fabric to withstand wear and tear. It comes in 5 different colors to choose from, and it’s suitable for travel and sports activities. It has large see-through mesh material at the front pockets, a wide mesh straps for comfort on your shoulders and click-lock secure strap. Nylon honeycomb Rip-Stop fabric, waterproof material to protect your items from rain or water splashes and tear resistant fabric to enhance the durability. The 2-way quality zippers for easy pull and smooth closure. More storage: It has multiple pockets with more storage of personal stuff. A spacious main compartment with high-quality zipper and inner zip pockets for secure storage of small items. It also has 2 side water bottle pockets. Versatile with multiple functionalities: You can fold into its inner pocket, use it as a sporty pouch for all your gadgets or easily unfold to use as a daypack. The multiple pockets allow preschool kids to use the bag for a picnic, hiking or school daypack. Airline approved rucksack: Use the Bago carry-on sack on airports to avoid extra charges. When not in use you can easily fold and fit it in your suitcase. Sturdy loop with carrying handles to lift with your hands. Solves the luggage weight problem by carrying out excess luggage, no overweight charges. Its convertible and foldable features make the bag compact and handy. You can store it as an extra bag when going shopping. Keep it in a glove box or motorcycle box. Very light (0.7 pounds), you will not strain your back when you go hiking or while running. Affordable packable daypack for adults, teens, and children (black). Full refund if not 100% satisfied with the backpack. Can be used as an all-around backpack due to the water-resistant fabric that protects your items and let you enjoy tasks like fishing, hunting or camping. It can be used as sports bags for storing your sports gear. Helps you enjoy stress-free travel by providing you with RFID blocking travel accessories to keep your cash, digital identity details and other essential documents secure. You don’t have to worry about pickpocketing or find out you have lost your passport. The bag is uniquely designed with quality material and zippers for comfort and style. It is worth your pennies. Availability of pre and after sale service to customers. If you have doubts, the dedicated customer care team will be there to help you with all the help you need. 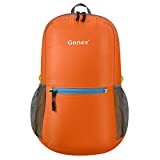 Gonex packable backpack is designed as a perfect companion for out and about activities. It is perfect for day trips, hikes, school, vacation, camping, travel, and shopping. Available in 8 trendy colors you can choose from. Compact spaces saving: You can easily fold to fit in an ultra-compact pouch and keep it as an extra bag for your trip when not in use and unfold it for carry-on baggage. Capacity and size: the bag has a capacity of 20L making it possible to carry a variety of personal items while traveling. The unfold size of 44*30*15cm and compact size 16*16cm. Organization: The multiple pockets allow easy organization of your items. The main pocket can carry clothes, shoes and other personal effects. The small outer pocket can be used for quick access items like guidebooks. The inner zip pockets are used to securely store valuable items like currencies and passports. Nylon mesh two side pockets can be used for water bottles or even snacks. Waterproof: It is made of high-quality material to withstand tear and water drops. It has SBS metal zipper with well-constructed seams. Lightweight material: Due to its lightweight, you can easily fold the bag to sandwich size. The nylon like material makes the bag strong and long-lasting. Suitable for daily use when traveling, hiking, shopping or even going for vacations. Large inner compartment to pack all the stuff you need for your trip. Very light due to the high-quality material used to make the bag. You can carry the backpack all day long without getting tired. I will recommend this to anyone who likes exploring outdoor activities. This super lightweight packable daypack has wide straps that make you feel comfortable, zippers that work smoothly and also enable you to travel in style. This is a user-friendly cross body pack for both men and women. The outdoor master sling bag is versatile and compact. It ensures you have all the essentials with you when on a trip. Available in black, grey, dark blue and green. Adjustable straps: soft and sturdy shoulder straps and you can easily adjust the straps length for comfort. It also has a reversible padded strap to change to. It has a lightweight single strap made of canvas polyester fabric. Secret pocket: the bag comes hidden anti-theft pockets to secure valuable items. Spacious main pockets to fit in your camera, iPad or small laptop and a crossbody design with a sturdy material. Single water bottle holder at the external side pocket. Capacity and size: it weighs 1 pound with a size of 18.9*12.6*4.0 inches. It has two main zippers and two smaller sleeves to hide more items. High-quality material that makes the bag last longer. Spacious sling bag for all your day luggage. The adjustment strap is held in the main strap with a loop. You don’t have to worry about being caught into objects. 6 months warranty guarantee and enjoy 100% satisfaction. Hikpro is a lighter luggage bag that enables you to carry a lot of personal items. This is the most durable lightweight packable backpack for both male and female. Lightweight material: has a weight of 6.5 ounces and a capacity of 20L making it a perfect pack for day trips, vacations, hikes, school or an extra bag for shopping. It has a size of 18*12*5.5 inch. Quality material: Made up of high-quality nylon material to withstand wear and tear and provide long-lasting performance. A durable abrasion resistant metal zipper and it is reinforced in more than 14 places with bartack process. The nylon material makes the bag weigh less and more durable. Small when folded: you can easily fold into a small pocket and put it into your purse and unfold it when you have extra luggage to carry especially at the airport to avoid overweight charges. Main pocket which is large enough to carry almost everything you need. The outer smaller pocket can be used for quick access items like cameras. Inner pockets double as a storage pouch for your cash, credit or debit cards and your passport. Two sides mesh pockets which can store bottles of water or an umbrella. Breathable mesh straps: It comes with comfortable and adjustable wide breathable mesh shoulder straps. The straps are easy to adjust and lock them firmly. A two-way SBS zipper makes it easy to pull when closing. Comfortable and easy to carry around. It makes you forget you’re carrying a backpack. It is ideal carry-on luggage for your weekend trips. Suitable for both outdoor tasks and urban backpacker. It has excellent seaming and scratch resistant. The nylon fabric makes it water resistant and is reinforced in more than 14 places making it stronger and boost the performance. Helps in keeping your stuff in order and well organized. This lightweight backpack offers you a solution to your travel storage needs. It is very light with high levels of comfort and functionality. Size, capacity, and weight: Outlander backpack weighs 0.71 ounces with a capacity of 35L. The bag folds into 8.5*5*12 inches, and when unfolded it has a size of 18.5*13*7.5 inches making it more compact. Multi-use with multiple compartments: Features a classic shape with an ultra-light design that makes the backpack versatile and adaptable for different uses. It has well-organized compartments; the outer compartment provides quick access to smaller items. Multiple pockets allow increased storage space with a roomy main compartment. The two front zipper pockets can be used to store small accessories and two side pockets for water bottles or umbrellas. No worries about zipper flaps. Durability: Outlander travel backpack is made of high Rip-proof and nylon fabric for water and tear resistant. To increase durability, bar tacking is used to reinforce stress points and a two-way abrasion resistant SBS metal zipper for a smooth pull. The nylon material provides a long-lasting experience with minimal weight. Carabiner clip: This is an aluminum clip used to attach things or clip it to things. Shoulder straps have a band to attach items. It also has a whistle buckle with a chest strap to enable you securely lock the backpack. Several compartments to offer a level of the organization while being spacious for all your travel needs. It is very stable and long-lasting. It has a sleek and stylish look if you’re looking for something light and comfortable. The backpack is ultra-light, ultra-durable and ultra-awesome for day-to-day use. A wider choice of colors to select from this sleek design. Helps you avoid extra charges by using it as a carry-on bag for extra baggage at the airport. This packable daypack is suitable for adults both male and female when organizing for trips, day hikes, vacations or camping. This backpack has multiple pockets to help you keep things organized. The travel backpack is well designed with the high-quality, water-resistant material. It is highly recommended for all your travel needs. Super lightweight: It is a true space saver with a roomy capacity 35L and a weight of 0.7 pounds making it ideal for long outdoor trek hours. The light material enables you to easily fold the bag into its inner pocket. Multiple compartments: To keep your items organized, the bag has multiple compartments with the main compartment providing enough space for 35L. The two separators in the main compartment allow more room to further organize your things. Two front pockets can hold small items and provide easy access. The side pockets can hold water bottles or an umbrella. Durability: Venture Pal is made of high-quality water, wear and tear resistant fabric which makes the backpack strong and long-lasting. The double layered bottom allows you to carry more load whereas the bar tracks enhance longevity at the major stress points. Heavy SBS two-way metal zippers on both sides are convenient for smooth pulling on whichever side you use. Comfort: Shoulder straps are made of breathable mesh and sponge padding to relieve pressure on your shoulder. You can adjust the length of the straps and secure lock the backpack with the chest strap. The whistle buckle for locking the chest strap can double as your whistle when in danger. Compact and handy: You can easily fold the bag into its inner pocket and pack it in your suitcase when not needed. Resistant to water, wear and tear. Provides superb experience and long-lasting. Comfortable and breathable shoulder straps. Lifetime warranty exchange with return policies. Venture pal 35L hiking daypack can be used by adults to provide convenient storage facilities with lots of pockets, zippers and compression straps. The bag can be used for multipurpose tasks like day trips, camping, school, hikes, travel, camping, etc. These packable daypacks are suitable for daily use at schools, day trips or when going for vacation. Outlander 20L/30L is a stylish daypack that offers great value for money invested. It is the most durable lightweight travel daypack designed from strong, high-quality material. This backpack will take care of your storage needs. Extremely durable due to high-quality rip-stop nylon material. The fabric makes the backpack resistant to water drops and wear and tear. The rip-stop nylon material makes the bag suitable for hiking activities due to its waterproof properties. It also makes the bag strong and long-lasting. 2-way abrasion resistant metal zippers available on both sides. SBS zippers are corrosion resistant and do not rust even when you subject them to a wet environment. The bar tack adds to the longevity of the backpack at the stress points. Lightweight in nature is making it the best packable daypack. The 20L weighs 0.46 pounds while the 33L weighs 0.5 pounds. The lightweight makes it suitable for day hikes and allows you to pack a lot of stuff you need for your day trip. Classic style. This Outlander backpack features high when it comes to the shape and multiple pockets that allows you to keep thing well organized and in order. The roomy main compartment can be used to store bulky stuff. The additional front two zipper pockets can allow quick access to small items whereas the inner zipper pockets can store valuables as it offers more security for your items. It also has two side pockets made of mesh material to store a water bottle or umbrella. Another best feature is the folding ability where you can fold this bag into a zippered inner pocket and pack it in your suitcase. Versatile ultra-light and reliable backpack. It is crafted to a sleek and stylish design if you want to keep things light and comfortable. Waterproof properties with the high-quality material to add longevity of the backpack. You can use carabiner clips to attach more items to the pack. The 20L capacity bag is suitable for daily activities or regular activities within a short distance travels. And the 33L capacity bag is suitable for hikes and other adventure because you can store a higher number of items for your short adventure. The bag you choose depends on the load to carry around. The high-quality fabric makes the bags resistant to water, wear and tear. When selecting backpacks look for those that can withstand the forces of nature, weigh less and have adjustable straps. Grab your packable daypack and take your trip in style!